Have you ever had the feeling that you’ve lived another life? Been somewhere that has felt totally familiar, even though you’ve never been there before, or felt that you know someone well, even though you are meeting them for the first time? It happens. In 2073 on the remote and secretive island of Blessed, where rumour has it that no one ages and no children are born, a visiting journalist, Eric Seven, and a young local woman known as Merle are ritually slain. Their deaths echo a moment ten centuries before, when, in the dark of the moon, a king was slain, tragically torn from his queen. Their souls search to be reunited, and as mother and son, artist and child, forbidden lovers, victims of a vampire they come close to finding what they’ve lost. In a novel comprising seven parts, each influenced by a moon – the flower moon, the harvest moon, the hunter’s moon, the blood moon – this is the story of Eric and Merle whose souls have been searching for each other since their untimely parting. Beautifully imagined, intricately and cleverly structured, this is a heart-wrenching and breathtaking love story with the hallmark Sedgwick gothic touches of atmosphere, blood-spilling and sacrifice. Why did we read this book: Well, for starters there is the awesomely creepy cover – please note the heart next to the knife: isn’t that striking?1 Plus, Ana read White Crow by this author last year and really enjoyed it and had been meaning trying another one of his books. 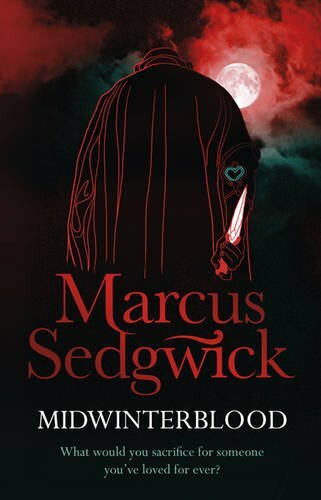 I have heard good things about Marcus Sedgwick, so when we were offered the chance to review Midwinterblood, I jumped at the chance. I wasn’t sure what to expect with Midwinterblood, but I certainly had no idea that I would love this book so much. Beautifully composed in seven parts, traveling backwards in time to the origin of Eric and Merle’s tragic story, Midwinterblood is a reverse-palimpsest of sorts – wholly unexpected, haunting, and utterly memorable. I loved it. It’s hard to write this review without spoiling any twists, but I can speak in generalities about how well planned and executed this novel is. Midwinterblood is like a set of matryoshka dolls; each story has another story locked within it, as some detail or memory of an earlier life. The novel in its entirety is the story of two lovers, each born again in seven different incarnations on the same small island, struggling to find each other and achieve some kind of happiness together across the centuries. How exactly their stories play out and why they are chasing each other across different lives, of course, is the true heart of the book and I won’t spoil that for you. I will, however, say that I loved that Eric and Merle’s love is reborn in different ways. They are not always born as lovers – once they are siblings, once they are mother and son, and so on – but they always find a way to be with each other, somehow. It is this twist that made the novel so much more poignant for me as a reader – because doomed love over the ages is a familiar enough theme. Reincarnation as love in all of its forms is something wholly different. Of all the stories, I will say that my favorites are that of the doomed fishmonger and the merchant’s daughter and the brother and sister that must evade an undead threat. Finally, I should mention how perfectly eerie and fitting the setting of Blessed Island is, with its hidden population, its mysterious hidden side, and its dragon-like flower that holds the secret to youth and life. When we are first introduced to the island in the year 2073, and its peculiar, childless inhabitants with secrets to protect, it’s all very Wicker Man-ish.2 I wished that there was more of a uniting thread that would tie Blessed Island and its uniquely potent orchid as well as the conceit of the different types of moons to the story of Eric and Merle, but other than that, Midwinterblood is pretty near perfect. Absolutely recommended, and I’ll definitely be around to read more from Marcus Sedgwick in the near future. Having read and enjoyed Marcus Sedgwick’s White Crow, I was very keen to read Midwinterblood. I was expecting a solid, spooky Halloween read but got so much more than that. The book surprised and delighted me with each of its interconnecting stories. The brilliance of this book is manifold. Part of it comes from the structure itself, divided in small chapters, each story set in a different era as they go back in time. Although the setting – a small, mysterious island – is the same throughout and so are the set of the protagonists (well, sort of), each story reads different from one another – they could be entirely independent had it not been for the ever-present feeling that they are not. Then there is the fact that each story has at least one a very unique distinctive element and most of them are even written in different genres: there is a War Drama, and classic Horror and even a terribly sad Ghost story. Then, there is the fact that this is a love story that acknowledges many different types of love and this is what moved the book from simply good to awesome for me. There is love between mother and son, between siblings, between friends and yes,of course romantic love which also included love between two people of the same gender. My absolute favourite was the aforementioned Ghost story because of not only the story itself but because the author managed to include a story-within-a-story-within-a-story with a twist. Genius. Midwinterblood is a very short book, a quick read (seriously, I devoured it within 2 hours) but one that packs quite the punch. From the beginning it brims with tension and one can’t help but to be engulfed by a suffocating sense of Impending Doom (making it a perfect Halloween read) but more than that, it is a story with heart and it’s full of sadness and sweetness and beauty. I loved it. The first thing to die is that brief silence, before the supreme violence. It is destroyed by Melle herself, whose body cannot contain the rage and the grief any longer. She does not care that she is a queen any more. She only knows that she loves her husband, and cannot bear to see him die. She tries to stand, and scrambles forward in the snow, but stumbles again immediately. Her legs will not obey her any more, she has lost the strength, and now she tries to pull herself forward through the freezing snow, her green robes sweeping it around her in miniature drifts. Thorolf nods to two of the women, who step forward and grasp Melle by the arms as she tries to stand again. She turns her head blindly to each of them, but they will not look at her. Their faces are set firm, and they are strong women, their hands dig into her soft arms like the winter ice grips the harbour, and she succumbs to them, her chest heaving. Eirikr turns his head towards her. He sees little. He has been smoking stem as well as drinking petals, and his mind is fogged. His queen, he thinks. That’s all. His queen. He does not feel the cold, though it bites his naked skin all over his body at once. He lifts his head to the moon, the blood moon, and he prays that his death will rescue his people. He is no longer certain that it will, not after the other blessings, whose skulls now hang in the evergreen, but he has said this to no one, for he knows that his people have nothing else now, and that it is only a small shred of belief. Without it, he knows they will be dead before the next full moon. Additional Thoughts: Marcus Sedgwick is blogging with us today, talking about inspirations and influences. Check it out HERE. I really want to read this, and now have other books by Marcus Sedgwick on my to read list, but it seems to be hard to find! Alright, I was half convinced already, now I’m 100% convinced and I’ll definitely read this book (and maybe see The Wicker Man also, since it was such a great influence)! My g-reader would be a lot shorter and a whole lot more satisfying if I only included bloggers who use the word “palimpsest” in their posts. But I’m so disappointed to discover that Midwinterblood isn’t available on the Kindle yet! After this review I wanted instant gratification. I have read Marcus Sedgwick in the past and enjoyed him, but I haven’t read this particular book. I enjoy when things are standalone, though. I am getting too overwhelmed with series. This sounds like a “Read in a Single Sitting” book for sure! I do have one of Sedgwick’s floating around at home (“The Book of Something or Other”), but have yet to get to it. Thanks for bring my attention to him! This book sounds very excellent. You had me at “matryoshka dolls”. Ah, I love your joint review, ladies! Especially Thea’s description of the book as matryoshka dolls (I admit, I cut and pasted that because I can never remember how to spell it). And its brilliance IS manifold. I’ve only read this and WHITE CROW by Marcus Sedgwick too, but you can bet I’ll be back for more. What a phenomenal writer.